Engage your students in citizen-science and STEM activities related to your local river and water sustainability July 31 – Aug. 2, 2014! Would you like hands-on experience in assessing the health of your local watershed and being able to teach that to others? If so, please join teachers, students, and watershed leaders at the amazing Gila River in Cliff, New Mexico, to learn ways to determine the health of your watershed, fisheries, and local rivers. We are collaborating with the Gila Conservation Education Center (GCEC) for the training ~they are helping us contact teachers and will have staff at the training too. To learn more about GCEC click here. To get directions see map and notes at the bottom of this page. 3:15pm River Ecology & Fisheries Program Watershed Watch intro and review of teacher’s primary objectives, work context and goals. 4pm. Walk a valley cross-section of the Gila River Valley & “reading the landscape” activity with GPS unit. 5:30pm. Complete settling in to camp spots, beds, set-up outdoor kitchen. 8:00 a.m. Head to Gila River Box (where there is water in the river!). Fish sampling, water chemistry and benthic sampling, fishing skills. B: Using free geographic information systems (GIS) and maps to explore land use, historic versus current conditions, and developing hypotheses and data analyses for river ecology studies. 8:15 a.m. Data interpretation for chemistry and insect data, How to Turn Data-to Info activity for students. Intro to WatershedWiser.org (create a site and add data). To reserve a space send email to Carlos. For existing sponsors indicate number of days and dietary and lodging preferences (camping or not). For new candidates indicate study purposes as well as food and lodging preferences. For further information please contact: Rich Schrader – rich@riversource.net, (505)660-7928 Rich or (505)231-4860 Carlos. Click here for more info on the Lichty Center. 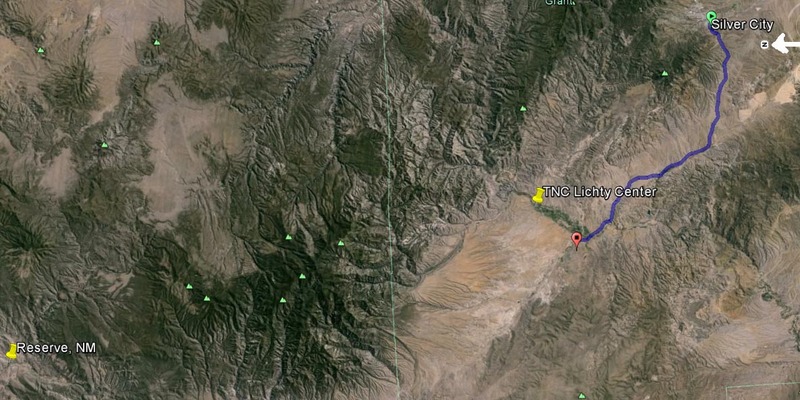 The Lichty Center is located in the floodplain of the Gila River valley about 35 miles (45 minutes) from Silver City. with a small sign that says “Gila River Farm”. If you are coming from the direction of Reserve, New Mexico, turn left (head north) at the first Hwy. 211. After about a mile on 211, go left (north) on Hwy. 293 and drive to mile marker 4. Take a right immediately after the mile marker sign, turning into the driveway with a small sign that says “Gila River Farm”.